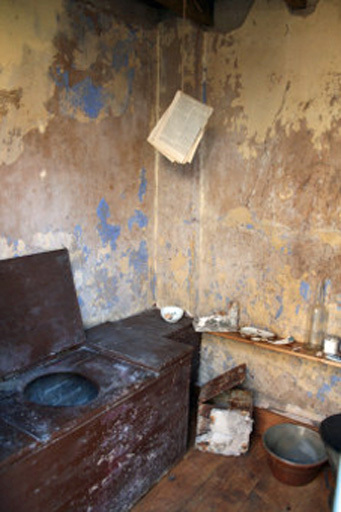 Interior of outdoor privy at Peckover House, NT. I found the following account in a transcription of a Norwich newspaper of March 1790. It had never occurred to me that a visit to the ‘Necessary House’—the outside lavatory—could turn out to be so dangerous! On Thursday last, a fine boy, about five years of age, fell thro’ the seat of the Necessary belonging to Mr. Mapes, in the Hay-market, the reservoir to which is not less than 40 feet deep: in this shocking situation he remained from a quarter past ten till three o’clock in the afternoon, before he was discovered by his cries. A person immediately went down to his relief, and when he had raised him halfway up the bucket in which the child was, striking against a timber that had not been perceived he was again precipitated to the bottom head forward. The second attempt to save him proved, however, successful, and, miraculous as it may appear, the infant is now in apparently perfect health. The humanity of a number of individuals on this occasion, spoke loudly for the goodness of their hearts. We hope this accident will make others cautious in guarding such dangerous places. As an aside, when I was at various times past in the desert parts of the USA, I encountered public toilets in parks and similar places where no water or sewerage was available. All consisted of a toilet seat over a hole leading to deep reservoir into which everything fell—the exact equivalent of an eighteenth-century Necessary House.